Vacations are not only about R&R. They are also learning experiences. 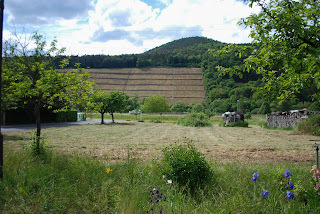 In my recent trip through rivers of Southern Germany I came to know a wine region new to me. Franconia is an ancient land with its own culture and dialect still in existence, despite having been geographically blended within Germany. It is mostly located within the state of Bavaria. Its largest cities are Nuremberg and Wurzberg. There, along the banks of the Main River, a tributary of the Rhine, lies a small wine appellation with the same name, that Germans refer to as Franken. 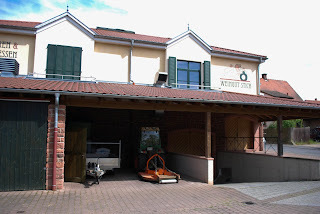 In the small town of Burgstadt, a stone’s throw from scenic Miltenberg along the Main, I visited Weingut Stich, a family owned winery where we were treated to a tour and tasting and, as an added bonus, fresh German pretzels, the best I’ve ever tasted. The winery was in a scenic valley facing a backdrop of hills with terraced vineyards planted into their steep sides. Phillip Stich, the youngest of the family, a lean, affable young man, gave us a tour of the modest premises. It is a small, simple, family run wine making operation, with an output of 7000 cases per year. 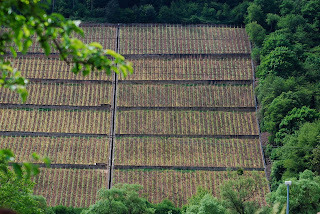 He pointed to the hills behind and emphasized the difficulty of cultivating and harvesting vines at such slopes. As he led us to the tasting room, he mentioned how much he had enjoyed Australia recently where he had spent an extended stay. Phillip explained that, like many in the region, a couple of generations ago everyone made wine for their personal use. Recently, however, various professional wineries have emerged from such families who, after a period selling their surpluses,have gotten more serious about wine making. The winery brochure proudly proclaims that the proprietors Helga and Gerhardt Stich are graduates of a German Wine Academy with degrees in Wein Engineering. Their son Phillip was sent to Australia to bring back New World techniques, a phenomenon now common in Old World countries. I have also witnessed it in France, Italy and Spain. Despite being known mainly for beer, with the highest density of breweries anywhere in Germany (over 400), Franconia has a 1200 year wine tradition, mostly white. Its main varietals are Muller Thurgau, Silvaner, Bacchus, Kerner and Riesling – in that order. 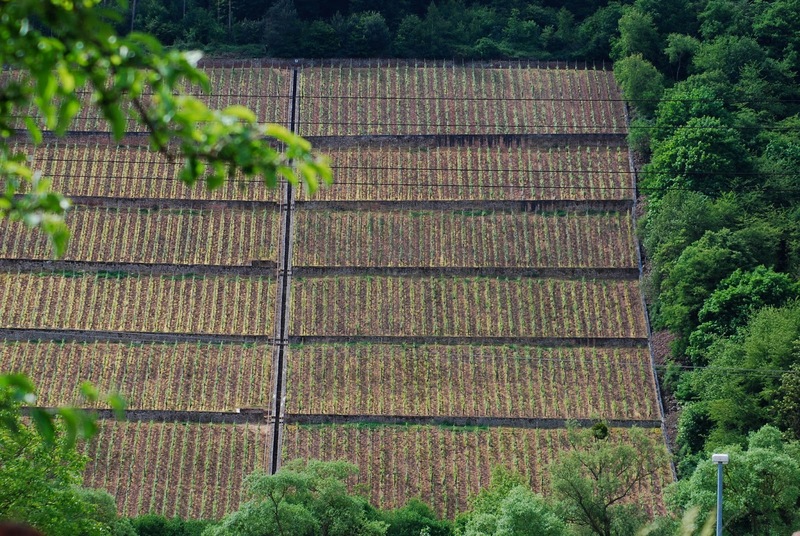 Riesling comprises only around 5% of production. 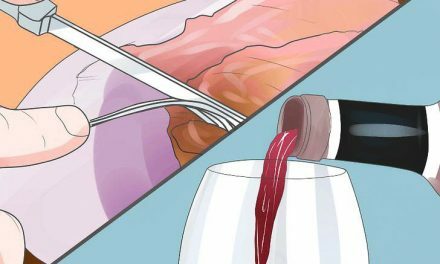 The main red grape cultivated is Spatsburgunder, the German name for Pinot Noir. At the tasting room Helga, bespectacled and shy, greeted us with an array of strange bottles in front of her that looked like they were made for liquor rather than wine. These, known as Bocksbeutel, are the primary storage vessels of Franconia. Literally translated, the word means “ram’s scrotum”, a reference to liquid sacks in use during Medieval times. Since 1989 these strange bottles have been patented for use in Franconia only, giving the region a unique trademark. The Stich wine list featured the German word trocken after each label, over and over. It means dry. Franconia is known for its lean, bone dry whites.We first tasted a 2015 Muller Thurgau. It had a light color, floral nose, crisp upfront fruit (green apples), and a nutty flavor before a pleasant, citrusy finish. It was indeed very dry. At 6.5 Euros it was a good bargain. Their 2013 Riesling Kabinett lacked the “diesel fuel” nose common to this grape; instead the nose was subtle, floral. The wine featured crisp peach and apricot flavors, its sweetness understated. It was a simple wine that reminded me of Chenin Blanc from the Loire region of France. Around 9 Euros, it was again a nice bargain. I bought one. Finally came a 2012 Spatsburgunder. It had a prominent, pleasantly smoky nose, undoubtedly acquired from spending time in oak barrels from the nearby Spesart Forest.The upfront fruit was also smoky and bacony, the mid-palate spicy. The wine was a bit rough, rustic and had an unpleasant, mediciny finish. Elegant pinot noir it was not. But it was less that 10 Euros, and probably a good food accompaniment. I bought one to try with dinner at the ship. 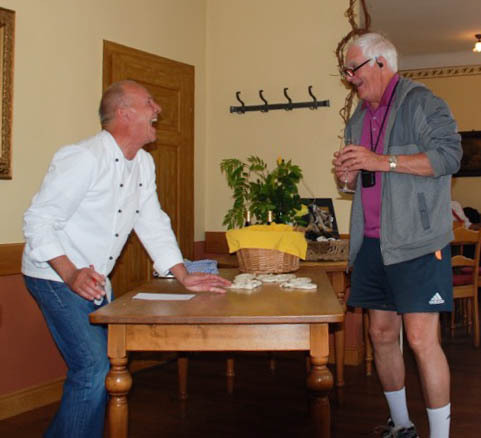 In the meanwhile, we were treated to a German pretzel-making lecture by a master baker who had a Johnny Carson style, affable stage presence. He unrolled his dough into long sticks and twisted them swiftly like a magician. Abundant basket-fulls of fresh pretzels were passed around. I am not a pretzel fan and initially I refused. But then my curiosity got the best of me and I took a bite. Soon I had downed two full pretzels – they were quite large – with more helpings of the Spatzburgunder. Germany has thirteen major wine regions. Here in the U.S. we paint the entire country with a single brush: sweet Reislings. In Burgstadt that day, as I got acquainted with one of those thirteen, encountering other varietals, most dry, indigenous to Franconia, I realized how over-simplistic this concept had been. I bid auf wiedersehen to Fraulein Stich and resisted the impulse to down another pretzel as I left with my two Bocksbeutels. Later that night in the ship, the Riesling turned out fine with dinner, but the Spatsburgunder was corked. Oh, well! I’ll wait for the next turn, whenever that may be. With global warming and improved wine making there is hope for the future.